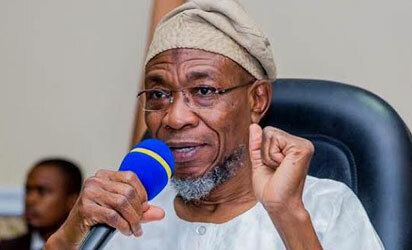 The Governor of Osun state, Mr Rauf Aregbesola, yesterday moved a motion for the probe of the claim on the allegation that politicians are putting pressure on the military to stage a coup in the country, even as the state House of Assembly honoured his with life membership of the house. “Honourable” Aregbesola moved the motion while performing his first legislative function after being honoured with Honourary Life Membership of the Osun State House of Assembly in Osogbo yesterday as part of the activities marking his 60th birthday anniversary. Aregbesola while commending the Chief of Army Staff, General Tukur Buratai, for his thorough professionalism and belief in the current democracy called for a probe into the coup allegation with a view to bringing any erring officers to book. He said, “I have also made the strident call for a political system and practice that is best suited for our clime, which will bring inclusion and amount to real political empowerment for all the people. “I have after our revered leaders, Chief Obafemi Awolowo, Chief Bola Ige, Asiwaju Bola Tinubu and others, all convinced federalist, argued that for a plural society like ours, true federal practice is a minimum condition of statehood. The Speaker of the House, Rt Hon. Najeem Folasayo, Salam attributed the unanimous decision of every member of the House to Aregbesola’s unprecedented contributions to the development of the state. The Guest lecturer and Leader House of Representatives, Mr. Femi Gbajabiamila in his lecture titled “suitability of presidential system in a multi-ethic democracy”, canvassed for restructuring of the Nigeria federal system so as to aid proper development. Gbajabiamila argued that for a nation to progress the system of government must fit into structure of governance, saying if both are not in tandem, then such nation is running a system and structure that are misnomer. According to him, the present 1999 Constitution of the Federal Republic of Nigeria conceded too much responsibilities to the federal government at the expense of other component units. The House of Representatives Leader thus canvassed for the decentralization of power from the federal to the federating states in line with international best practices of true federalism.